Before I start talking about the Great Wall, Gregory would like me to tell you about the breakfast buffet at our hotel. He says that buffet isn’t the right word, it should be called something like “Food Fantasy.” I didn’t take any pictures, but there was a European/American section with pancakes, waffles, pastries, cereal, fruit, and yogurt. There was a Japanese section with sushi. There was a Chinese section with dumplings and grilled fish. Oh, and an omelet bar. Sadly for Gregory, he did not have enough time to finish his third plate because we were just out of time and had to meet our guide. As we drove out of the city, you could see the mountains ahead, and then we could see some of the Great Wall going up the mountain! Nancy told us repeatedly that we were extremely lucky because she has never seen such good weather. There is absolutely no smog, a beautiful blue sky, and a nice breeze. It was the perfect day to climb the Great Wall. Or at least a tiny section of it. Everyone was very excited, so there was a festive atmosphere. People were smiling at each other and giving encouragement to those who took a little longer. The steps are uneven, with some being close together and other far apart. They all had grooves or missing chunks. Nancy told us that most of the Great Wall is crumbling and too dangerous to climb except for these few preserved areas around Beijing. 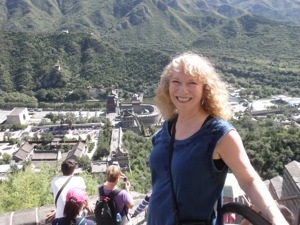 Linda recently had knee-replacement surgery because she said she wanted to be able to climb the Great Wall and it was a great motivator for her physical therapy. She was able to make it to the 3rd tower. It was so beautiful there, we all could have stayed for much longer. But Nancy has lots of plans, so we kept going. She has a great schedule too, because there were lots of busses pulling in as we left but it didn’t seem crowded while we were there. 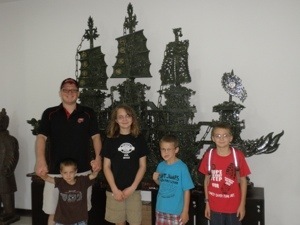 Next we went to the government jade factory. We were able to see someone carving a jade family ball and many samples of exquisite jade carving craftsmanship. We had lunch at the restaurant upstairs, and then headed back into Beijing. I thought you might appreciate Gregory’s pirate face for the giant jade boat. The next stop was the hutong tour. Hutongs are the old city dwellings, which were small houses with courtyards which grew into a maze of dwellings. 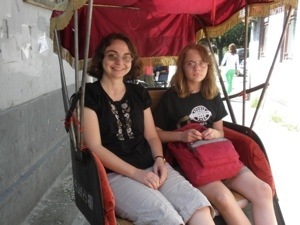 We were driven in rickshaws in the small alleys. It was nice to see people sitting around and chatting. There were many people playing majong, having a drink, hanging laundry, or reading a kindle. 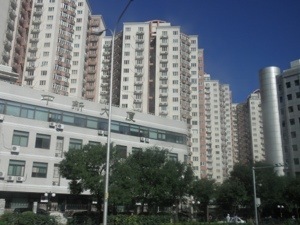 It definitely had more of a community feel than the giant apartment buildings. We had the opportunity to tour the inside of one, and when we talked with the owner we found that she was born in the same month and year as Linda. The hutong tour was the last stop on our schedule for the day. We spent some time resting when we got back, and now the kids are downstairs swimming in the hotel pool with Matt and Grandma. I have figured out how to add pictures to the blog entries but it looks as if it is publishing the entry every time I add a picture, so I apologize if you are seeing it several times in a reader. So glad you had such a great day at the Wall!! Loving the updates! 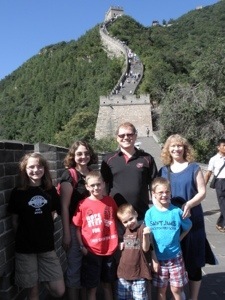 We, too, lucked out with a beautiful clear day for our tour of the Great Wall. The view is just amazing. However, I’m sad that we were not able to actually enter a hutong. We just rode around through all the alleys.